I spent last weekend experimenting with various ways to cope with a disappointing haircut. And before you say, “Oh it can’t be that bad!” let me assure you that it is. My hair looks like Carol Brady and David Cassidy had a baby, and that baby grew up to bear the illegitimate spawn of Billy Ray Cyrus after a night of too many Bartles and Jaymes Apple Passion Wine Coolers at the Georgia State fair. In other words, I suddenly have a Mom Mullet. The worst part is that it’s really all my fault. 1. Do not wait too long in between haircuts or your stylist may assume you live in a bunker and need something practical for months of surviving underground. 2. Your stylist is not a mind reader. Bring a photograph with you because your verbal description of bangs and layers might sound exactly like her vision of David Spade in Joe Dirt. 3. If your scheduled hair appointment falls on a day when you are experiencing any type of PMS symptoms, reschedule. Trust me, your stylist would much rather have a last minute hole in her schedule than have to watch you ugly cry. 4. Never befriend your stylist on Facebook or tell her about your blog or you will have no safe place to vent your self-loathing without accidentally making her feel bad. 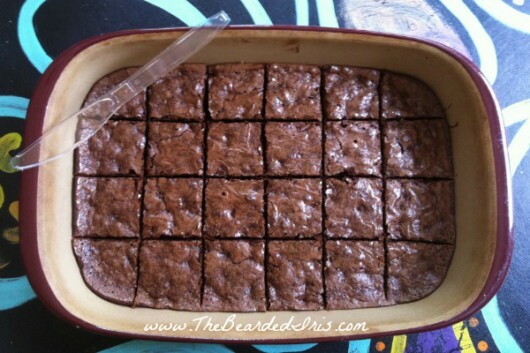 Totally switching gears (mainly to stop perseverating about my haircut), but one of the best tips I’ve ever discovered and shared on my blog is that the most effective way to cut brownies (once they are cool!) is with a plastic knife. For some reason the brownies won’t stick to the plastic knife and get all mangled when you slice them. Try this. It really works! I’m a hairy woman, hence “The Bearded Iris” moniker. And it’s getting worse the older I get. The main problem with getting hairier with age is that the amount of facial hair increases in direct proportion with the decline of our vision. Thus, it becomes harder and harder to see the facial hairs you want to pluck. Yeah, yeah, I know all about laser hair removal. It didn’t work for me. And I’m too cheap and lazy to go get waxed or threaded on a regular basis. So I do it myself and I recently discovered a tool that makes it so much easier and faster than individual plucking, particularly given my newly developing presbyopia. It’s the REM Spring® and I found it through a friend on Twitter. It’s a flexible stainless steel spring that costs about $15 and it works wonders! It does hurt, I’m not going to lie. But you get used to it. And I love that it grabs my nanny goat neck hairs that I can never seem to see in my magnifying mirror. And hey, if it doesn’t make you cry a little, you’re probably doing it wrong. At least that’s what my hair stylist tells me. Check out In The Powder Room where she is Editor-in-Chief. Read her personal blog: The Bearded Iris: A Recalcitrant Wife and Mother Tells All.